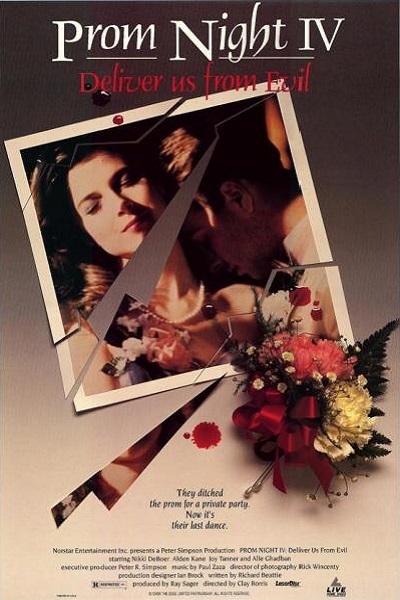 I mentioned in my review of Prom Night III: The Last Kiss (1990) the oddity of a horror franchise starting off with a hit, following it up with an unrelated sequel, and then building on the latter instalment while completely ignoring the original. Clay Borris’ Prom Night IV: Deliver Us from Evil goes one step further, spinning off Hello Mary Lou: Prom Night II (1987) in the most tenuous fashion imaginable so as to introduce a brand new monster, one closer in tone to the killer from Prom Night (1980), albeit not really. The film opens on prom night 1957 at Hamilton High, where Mary Lou is fated to flame up like Johnny Storm in drag. Mere hours before the gruesome incident that would haunt us for two sequels, a young couple sneaks off for some parking lot loving only to get set on fire themselves by the maniacal Father Jonas (James Carver). I’m a bit confused about his motivation. The Church believes him possessed by the devil on account of his spontaneously bleeding from the hands and feet. However, stigmata is considered a miracle in most religious circles, and our villain explicitly says he wants to save “the sluts and the whores” by delivering them to Jesus. Moreover, given that Jonas has to resurface in 1992 to terrorise a contemporary cast of characters, wouldn’t it have made more sense to set the opening sequence just twelve years prior during the original Prom Night? Instead, Borris throws in an awkward reference to Jamie Lee Curtis, intimating that the first movie in the series is to be viewed as a piece of fiction even within the fictional universe of Prom Night IV: Deliver Us from Evil but that the second and third instalments are cannon, or maybe just the part about Hamilton High organising a prom in 1957, and, yes, I realise I’m over thinking the hell out of this. The point is that, after spending a lot of time in a secret Catholic dungeon (I can’t believe I just wrote this), Jonas finds himself in the care of a rookie missionary, who, of course, lets him escape because there wouldn’t be a movie otherwise. Intriguingly, Prom Night IV: Deliver Us from Evil provides young Father Colin (Brock Simpson) with a genuine back story and supporting cast, including an ex girlfriend (Deni Delroy) who kind of wishes the boy would get off his God trip so they can resume their happy lives. I like this idea a lot, as we often forget that people aren’t born into the clergy. Priests and nuns have to make a conscious commitment, one ripe with dramatic potential that admittedly has nothing to do with the series’ title. Otherwise, our four protagonists prove themselves an absolute bore, prattling on and on about the minutia of their evening when screenwriter Richard Beattie ought to be focusing on the truck-sized plot holes sprinkled throughout Prom Night IV: Deliver Us from Evil. Consider the scene in which Jonas prank calls Meagan from inside the house. What, was the Vatican developing cell phone prototypes in its secret dungeons? How did he get our heroes’ number anyway? Yes, I get that the sequence pays homage to Black Christmas. In fact, I suspect the whole project might have started as a sequel to Bob Clark’s 1974 classic. How else to explain all the references to snow despite most proms being set in June, or the forced point-of-view shots of Jonas leering from outside the mansion when the movie’s trying to build tension in the wine cellar (i.e. inside the mansion)? I don’t care what horror flick the filmmakers were trying to follow up. Prom Night IV: Deliver Us from Evil is an unholy mess.